Every now and again, there's a Dutch song on this blog and it is usually met with muted silence. Still, I'm always curious what foreign readers think of these songs. I don't buy the Dutch trash, it's usually the better pop songs that end up here. 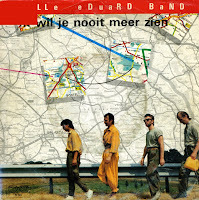 'Ik wil je nooit meer zien' ('I never want to see you again') by the Polle Eduard Band is an example of Eighties pop that can certainly compete with international bands around at that time. The lyric is full of hate for an ex-lover. The single did not chart in the Netherlands - and not outside of the country either, obviously.